Degree students from University Centre Weston (UCW) impressed so much with their choral performance at Pure Comms’ Christmas black tie dinner that the company has decided to support them in putting on an upcoming show. 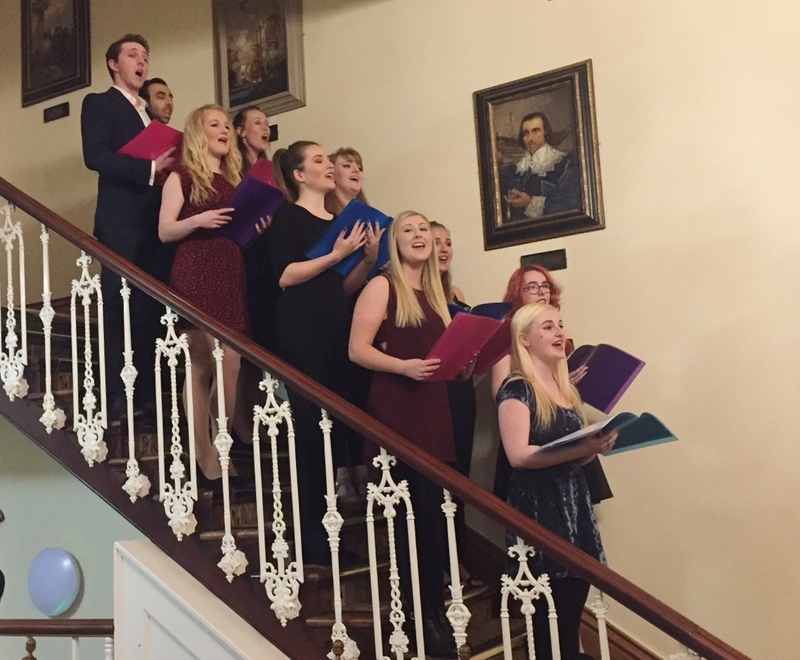 The BA (Hons) Musical Theatre students performed festive classics including ‘Santa Baby’ and ‘Winter Wonderland’ to an audience of more than 50 people at the Pure Comms Christmas dinner for clients at Mansion House in Clifton, Bristol, on Wednesday (7th December). The performance went down so well with Pure Comms’ guests that the Clevedon-based telecommunications and IT services company has donated £150 to the enterprising students’ theatre company. In order to graduate from their course, which is delivered by UCW in partnership with Bath Spa University, the aspiring singers and actors have formed a theatre company to fund, produce and stage a musical. The company, called E3, will perform Sweet Charity at the Playhouse Theatre, Weston, on Wednesday 22nd March. Jane Vivian, Pure Comms’ Business Development Director, said: “The students from UCW were outstanding; their performance was incredible and they conducted themselves in a very professional manner on arrival, during and after the performance. “We had some very positive feedback from our clients, with the performance adding a memorable touch to the evening. “Our business believes in supporting the next generation of business leaders, and these students have shown an entrepreneurial spirit. UCW Lecturer Abi Burkinshaw said: “We were delighted to accept Pure Comms’ invitation to sing at their event because taking advantage of these opportunities to perform for an audience in a professional context is central to studying at the UCW Academy of Performing Arts.